A wall clock is a very important accessory in your house. For instance, a house with an acrylic red heart clock will create the first impression to your visitors. It is also evident that a house or office with a wall clock would say a lot about someone. If you have been looking for a superior and designer wall clock for your house or maybe to give someone as a gift, Petcarl Décor is a clocks selling shop that you can rely on to buy a clock or many other house decorating products. We aim at providing customized wall clocks that are very unique and also affordable. It is one of the most beautiful wall clocks that would definitely change the look of your house. 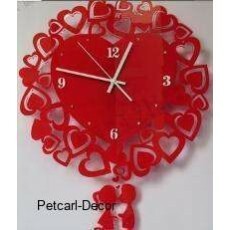 An acrylic red heart clock is very easy to fix on your wall and still remove from wall without damaging your wall. You are free to visit our clocks selling shop at anytime.